Vivek Shanbhag is a well-known Kannada writer whose highly acclaimed novel Ghachar Ghochar was translated into English by Srinath Perur and published by HarperCollins. The word translation means to bear across. The recent emphasis on translation in Indian publishing has allowed us to read narratives that were earlier hidden from us. An important writer such as Shanbhag is borne across to an Anglophone audience who is awarded a rare glimpse into Kannada literature. Perur’s seamless and powerful translation reminded me of the work of translator Lakshmi Holmstorm who has borne across many Tamil writers. What struck me first was the cover: a foray of ants radiated from the centre of a coffee-stained saucer. It was a carefully chosen image with an immediacy that drew me in even before I had started reading. What did the spilt coffee represent? Was the abundance of ants a metaphor for challenge or squalor? Who had been drinking the coffee, and why was this the opening image of the book? Was this cup served at home or in a coffee house? Most importantly, where was this place? In which state, city and quarter? Second, Suketu Mehta’s comment on the back saying, “Here is an India immediately recognisable to Indians, not an exotic concoction fabricated for a foreign audience.” This piqued my interest because it is difficult to find a book in which India is recognisable, in which the specificities of the narrative are peculiar to life in the subcontinent. The coffee is being drunk in an old school coffee house which remains itself as the city evolves around it. The ants are an infestation which overwhelm the lives of a small family who live in a cramped space. In bringing the two together, the cover image strings together the two warring portions of the narrator’s life: his uncertain identity as an individual, and the immovable role he plays in the collective family. He is an unemployed man with a tepid personality whose strength lies in his ability to observe people. In that way, he reminds one of the colourless narrator in Amitav Ghosh’s Shadow Lines, who is interested in people and is only interesting through his observations. The book looks hard at the nouveau rich in India and the consequences of wealth on relationships with the community, with in-laws, with work ethic, and with morality. It exposes the schisms that appear in families as wealth displaces them from their routines, from everything their middle-class lives have taught them to emulate. Their lives and their sense of themselves disintegrates into ghachar ghochar—a made-up term which means that things have not gone to plan and have become tangled. When you enter the world of Ghachar Ghochar, you are drawn to the layered transparency of the characters. Their projected selves against the backdrop of their real selves, their carefully arranged lives against the perversity of their motivations. The novel is compelling because it is layered. The book allows each character to be his or herself to a fullness which allows the reader to like and dislike them as if they were real people. I found myself disliking the narrator for his reductive, misogynistic appraisals of women as vicious and angry instead of understanding the circumstances that made them so. I found myself personally invested in their endeavour to rid themselves of the ants. I found myself rooting for the family when they save up and buy a gas stove. 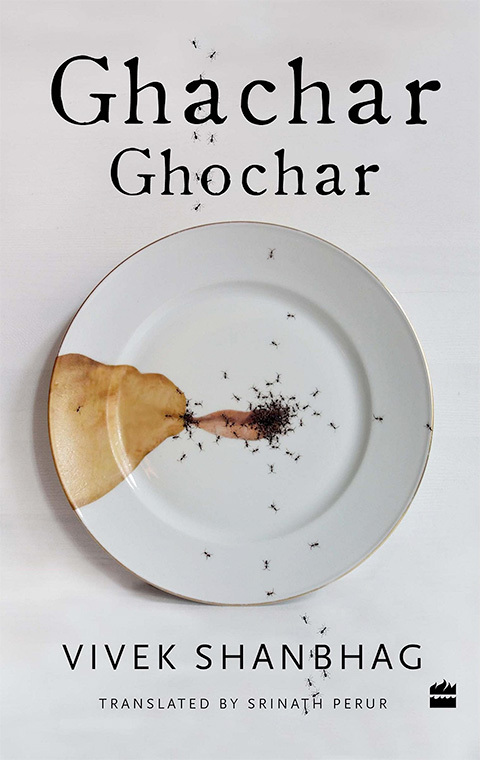 Ghachar Ghochar is an important book for those interested in Indian literary fiction. It is the first Kannada novel I have read, and the persuasive translation made me realise how much I have been missing.